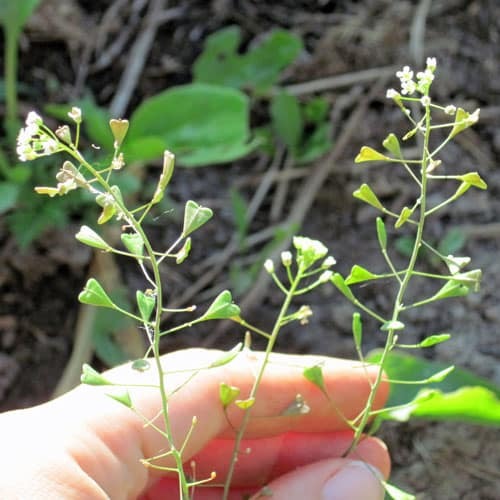 Today's featured plant is Shepherd's Purse, Capsella bursa-pastoris. 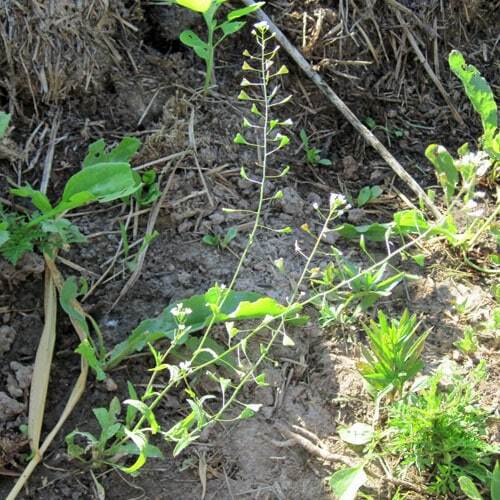 Shepherd's Purse is also known as Blind Weed, Bolsa del Pastor, Bolsa-de-Pastor, Bourse a Pasteur, Bourse-à-Pasteur, Bursae Pastoris Herba, Capsella, Capselle a Pasteur, Capsella bursa-pastoris, Caseweed, Cocowort, Erva-Do-Bom-Pastor, Hirtentaschel, Lady's Purse, Mother's-Heart, Naeng-i, Pepper-And-Salt, Pick-Pocket, Poor Man's Parmacettie, Rattle Pouches, Sanguinary, Shepherd's Heart, Shepherd's Scrip, Shepherd's Sprout, Shovelweed, St. James' Weed, Thlaspi bursa-pastoris, Toywort, Witches' Pouches, and Zurron de Pastor. This initial rosette gives way to a larger rosette a few inches across, followed by 4 to 20 inch flower spikes. As these spikes grow, purse-shaped (I think they look more heart shaped) seed capsules form along the flower stems. These are the most easily identified feature of the plant. The flowers are small and white, with four petals. It flowers year round, as temperatures allow. A single plant can produce from 500 to 90,000 seeds. If you wish to keep them from randomly seeding out, pull them when the soil is moist (they have a fine tap root). I personally don't find them to be overly invasive, but they are considered as such in some areas. The photo below shows the entire plant. Note the small rosette at the base and the long, spindly flower stalks. The leaves serve as food for grazing animals, and many small mammals and birds eat the seeds of shepherd's purse. Bees, flies, wasps, butterflies and skippers feed on the small flowers. (For a detailed list of nectar feeders who use this plant, visit Illinois Wildflowers.info. The greens of shepherd's purse are fairly mild (it's in the mustard family, which tends to have rather bitter greens). They can be eaten raw or cooked, but thus far I've only sampled as I've been working in the garden. This herb contains alkaloids, substances like thiamine, histamine, histidine, flavonoids, phenolic compounds, organic acids, tannins, lectins, bitter compounds, volatile oil, mineral salts, and vitamins. Shepherd's purse has analeptic properties, can adjust blood pressure, and is also a haemostatic herb, an astringent vasoconstrictor able to stimulate leucocytosis. It has haemostatic and vasoconstrictor effects and it can be used to treat all types of bleedings: nosebleeds, stomach bleeds, and menorrhagia. It has a considerable effect over the uterus, adjusting the menstrual cycle and putting a stop to the abundant uterine bleeding. In affections such as atherosclerosis, angina pectoris, it is recommended to drink tea from shepherd's purse because it can adjust blood pressure. Prolonged treatments with tea or tincture prevent nasal hemorrhoids and abundant menstrual cycles, especially in the cases of hypertensive women or those suffering from obesity. In cases of stress or anxiety, the use of mixtures made from shepherd's purse, is recommended. Also, in case of bug bites, the wounds are massaged with mashed herb. In case of bleeding haemorrhoids, small intestinal enemas or bath water containing lukewarm infusions of shepherd's purse are an effective treatment. Also, women who have swollen breasts during breastfeeding should heat up water containing shepherd's purse and apply it on their breasts in small amounts. This medicinal herb has good results in dealing with muscle-related illnesses. In case of muscle atrophy it is recommended to rub the spots with shepherd's purse tincture and to drink four cups of tea made of lady's mantle herb. This treatment can also be applied in cases of hernias. The Holistic Herbal recommends taking a cup of tea 2-3 times per day for most ailments, or one cup every 2-3 hours just prior to and during the menstrual cycle to help regulate the flow. It can be used to stimulate the menstrual process and to reduce excess flow. Herbal tea is made by covering 1-2 teaspoons of the dried herb with boiling water and infusing for 10 minutes. I like to place a small plate over my steeping cup to retain any volatile oils that may be released by the herbs. Strain and drink plain or with a bit of raw honey. This same infusion can also be applied topically by soaking a gauze pad in the liquid and applying to the affected area, such as the nose, or by adding it to a bath. Mountain Rose Herbs carries an excellent array of dried herbs and herb seeds, essential oils, tea making equipment, bottle and containers – pretty much everything you need to put your herbs to use. Plus, your purchase helps support this site and the Weekly Weeder series. They used to carry shepherd's purse, but don't have it currently listed (6/14/2013). This post is provided for informational purposes only. It is not meant to diagnose or treat any condition. Please consult a trained herbalist or your doctor if you are pregnant or nursing or on any medications, as herbs may interact with other medicines. Although generally well tolerated with less side affects than many medications, allergic reactions may occur in rare instances. Always use common sense and make sure you have positively identified a plant before using. If you can't find shepherd's purse in your garden, it is available online as seeds, bulk dried, in capsules, and in extract.